Curious about climate change? Live near the coast or maybe dreaming about waterfront property? You’ll want to read this. 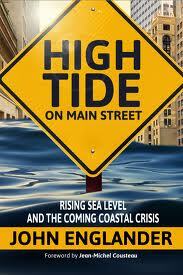 An easy read is not something I would normally associate with a book on rising sea levels and climate change, but John Englander’s new book, High Tide on Main Street: Rising Sea Levels and the Coming Coastal Crisis, is just that. This is probably one of the most reader-friendly climate change books on the market, with its concise writing, easy analogies, copious charts and periodic witticisms. High Tide on Main Street is almost like a “Rising Sea Levels for Dummies” in that it presents complex science in a very accessible fashion. Englander, a lecturer, consultant and author with a dual degree in geology and economics, eases you into the topic by setting aside any sort of activism, blame, or gloom and doom prophesies, taking great care to illustrate the history of natural climate change over billions of years leading up to the present. Englander explains the current problems with rising temperatures and how this contributes to rising sea levels, the consequences of which we have already begun to see. For example, he calls attention to a prediction from several years ago that New York was at risk for a massive hurricane. After the book went to press and literally right before it hit the shelves, Hurricane Sandy devastated the east coast. If that doesn’t convince you that climate change is happening, take a trip to the coast and ask people there if they’ve noticed a change. The water levels are rising, people are losing their land, and in some places, their homes. Islands are sinking (erm, ever heard of a place called Venice?) and water is creeping up. I know I saw it during my honeymoon on Prince Edward Island on the Canadian east coast, where you can see the water practically creeping up onto people’s front lawns. Englander outlines the economic disaster that awaits us in the next century if we don’t act now to slow carbon emissions and stop the rising global temperature. Again, these economic consequences (nevermind the loss of human life and quality of life) are already apparent in the wake of Hurricanes Sandy and Katrina as the government spends millions of dollars in compensation, insurance and rebuilding infrastructure. I highly recommend you get yourself a copy of this book, whether out of concern for the environment and the well-being of coastal communities, economic concerns or even if you’re just looking to be better informed when it comes to family dinner debates about climate change! I receive a lot of queries to review books, almost all of which I turn down because they are not in keeping with the values of Poor and Gluten Free. I chose to review this book because it’s an important topic. While I did receive a free copy of this book for review, I received no other compensation. Acceptance of a product for review is not a guarantee of a positive review.